Construction of a carbon-carbon bond is one of the most essential and fundamental subjects in organic synthesis. Recent advances in organometallic chemistry allow an efficient transformation of a carbon-metal bond or a carbon-metalloid bond into a carbon-carbon bond. 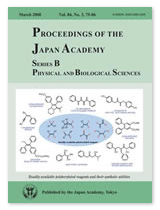 In this context, the polyborylated reagents, which Professors Hiyama and Shimizu invented recently, are promising intermediates for synthesis of a wide variety of target organic compounds. 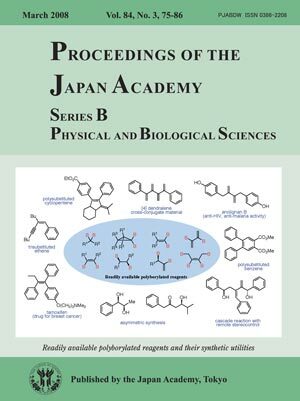 They developed 1,1-diborylation of lithium carbenoids as well as 1,2-diborylation of carbon–carbon multiple bonds with diboron compounds affording diverse kinds of 1,1- and 1,2-diborylated compounds as illustrated in the center of the Scheme on the cover page. Furthermore, 1,2,3,4-tetraboryl-2-butene can also be prepared as a single stereoisomer. These di- and tetraborylated reagents lead to invention of many novel and useful synthetic methods. Structural formulae shown around the central circle are examples that demonstrate the synthetic versatility and potential. As described, the carbon-boron bonds of the polyborylated reagents were effectively converted into carbon-carbon bonds or carbon-oxygen bonds. The reactions proceed with excellent stereocontrol even when alternative isomer formation may be possible. Thus, the high potential of the present method for organic synthesis has been nicely demonstrated.